As a connoisseur of new experiences, and with an attitude of “I’ll try anything once,” I thought the advertised “Goat Yoga” sounded fun. I like to be physically active, and I really like animals, so why not? I signed up. I have never really tried yoga before but thought it seemed do-able. I mean, hey, I crawl through mud and jump over fire at extreme obstacle courses, I think I can handle a little stretching while baby goats played nearby. I was ready for this goat yoga thing. I did a little research prior to the Feb. 5 session and learned the purpose of goat yoga is to provide a sense of calm amidst a busy life and serve as a form of animal-assisted therapy to help release stress and anxiety. I arrived at the class on the banks of Lake LBJ in Horseshoe Bay and joined the small group of eager goat yoga participants gathered around picnic tables and sipping glasses of wine and chilled water. I had a bad headache but decided to push on. Once everyone arrived, we were introduced to our instructor and the two adorable baby goats, Lucy and Leonard, that would be joining us. After the introductions were made, everyone selected a yoga mat and towel then headed for the rooftop deck overlooking a channel on the lake. It was a very nice evening to be outside: The sun was setting, and it was quiet and still. We took our places, and Lucy and Leonard begin to roam among the participants. The instructor guided us through several yoga poses, explaining what we should be feeling along the way. Most of my fellow class members went through the poses with ease and appeared to be experienced in the practice of yoga. Lucy and Leonard made the rounds and went to each mat (goat treats were sprinkled around the mats), eagerly sniffing and visiting us all. I must say, I struggled through the poses and occasionally forewent a pose to pet a goat or snap a photo. Toward the end of the class, students were offered the opportunity to get into the table pose with Lucy or Leonard perched on their backs, which made for very cute photos. As the class concluded, we headed off the deck and down to the picnic tables for post-goat yoga refreshment: beautiful trays of various goat cheeses and crackers as well as more chilled wine and water. I greatly enjoyed the goats, the goat cheese, and the experience. My headache had also magically disappeared by the end of the session. As far as the actual yoga itself, well, I don’t think I’m cut out for that. I would recommend people trying it for themselves as we are all very different creatures and my experience might not be the same as yours. 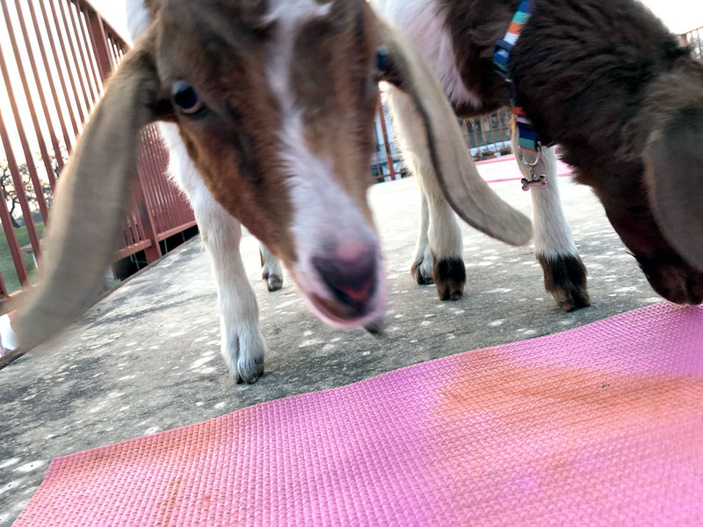 This was a test run for goat yoga, which organizers hope becomes a weekly class. Contact Haley Houston at hhouston08@yahoo.com for more information.